All the sizes for mini residential lots. In the archive Mini_Residential_Lots.rar you'll find all the horizontal sizes: 1x1 - 2x1 - 3x1 - 4x1 - 5x1 - 6x1. In the archive ML_Mini_Vertical-ResidentialLots.rar you'll find all the vertical sizes: 1x2 - 1x3 -1x4 - 1x5. Please, look at the screenshots. In the game you'll find the lots in the Lots & Houses Bin - > Unoccupied even if they are empty. The various lots can be easily identified in the catalog, thanks to the clear thumbnails. Don't look for them in the empty lots!! 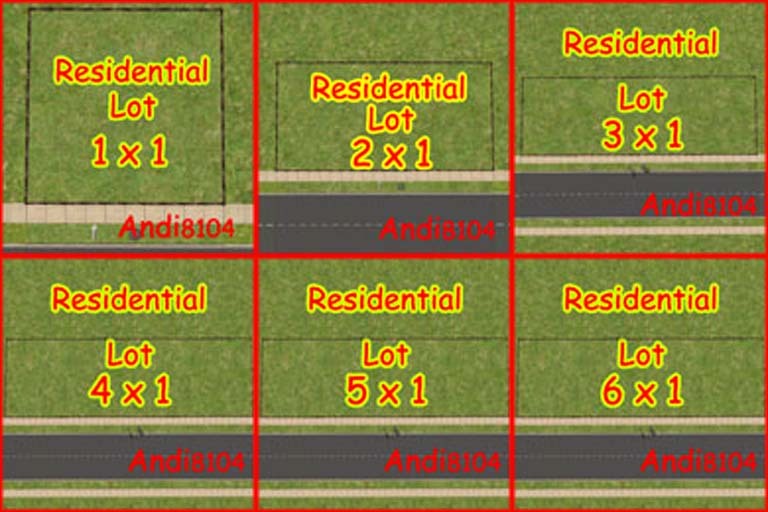 Anyone can freely use these lots to build his own lots, as long as they are posted ONLY on free sites. Many thanks and credits to Andy8104 for the Lot Expander, and for having created the 1x1 lot in the first place. And, as usally, thanks to Numenor for his advice and suggestions.